Some things you just can't say with words. The Two of Cups represents that elevation of the senses which is Romance, that flirtatious anticipation, enjoying the thrill of the now while looking forward to the unknown blissful moments to come. Passion exists in Romance--is the foundation of it--but more important is the splendid joy of your connection with each other, on all levels. And if you can add class and elegance to the picture, like Astaire and Rogers, all the better. 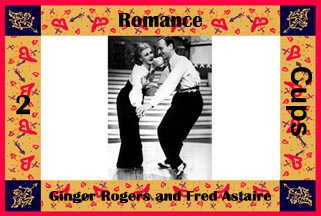 Fred and Ginger were tapping away at Fred Astaire and Ginger Rogers at RKO: Photos.